I have posted plants here and there, but I thought the Gallery would be a nice place to show most of my plants, which is my "Indoor Garden" . My captions didn't go under all the pictures. I guess I forgot how to do this. Sorry. Seven Zinnia plants came up from the seeds Diane sent me, and are blooming and branching out. Every year I have Impatiens and Dianthus, which bloom and bloom!! I have seven Dianthus plants this year. My Jades are my love (I did post a little in a Jade topic). 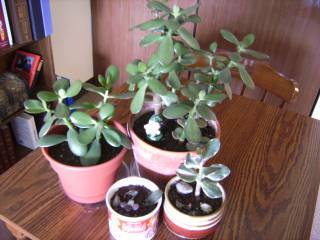 I took a piece out of the top of the large Jade and planted it, which has grown to the next sized plant. I took a leaf of the bottom and stuck in the dirt in a soup mug and now have two tiny babies. The Varigated one is from a start which Diane sent me last year. I have been babying it along, although it is growing very slowly...but I love it! 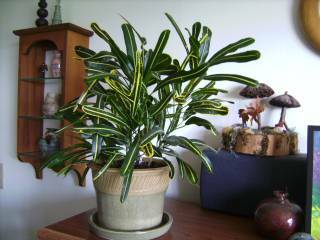 My big Croton...what can I say! Isn't it pretty?? One piece was growing taller that the other two so I took the top out and stuck it in the dirt in the same pot....hoping it roots and keeps growing. Ahhhh...now for my baby!!! I have regrown that Shamrock several times!!! One year I separated it's bulbs, which were all twisted together and repotted them in separate pots and gave two away. The one I kept grew large. This past December I cut it WAY back, down to about one stems! 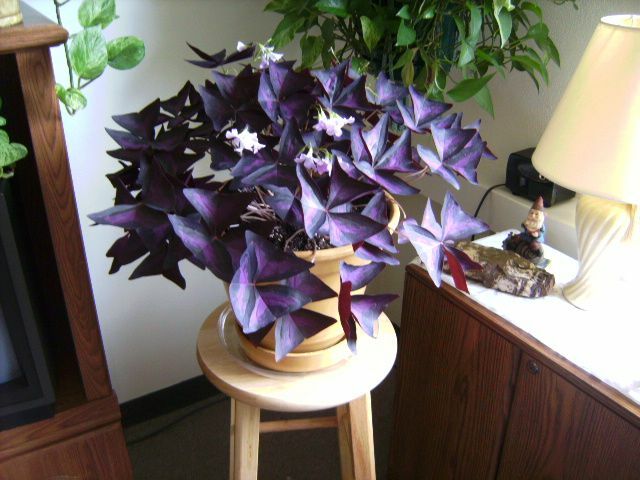 When I came home a month later, it had grown up to about 3 or 4 inches, with several leaves!! It has grown this huge just since then!!! I finally had buy it's on pedestal to showcase it, and because it took up too much room on the table in front of my window. After all, I had to make room for more plants!! I can't say it enough,,,,, I am so Impressed you get outdoor flowers to grow from seed in your fifth floor apt w/ No grow lights,, Just you and TLC and they bloom for you,,,,, I find that amazing!!!!! I can only imagine what you would do outside if you had the land to work your wonders! Thanks!! Diane, I hope you are still saving a little bit of dirt in your garden for me to play in when I get to TX!!! I'm going to play in yours too Cindy, in June!! The photo of my Shamrock doesn't even begin to do it justice!!! your shamrock is so pretty. Does it need a lot of shade? That is a lovely bunch of plants.. Yours are nice and green.. How very cheery. I thought I seen a little willy in one pot?? Sheri, it doesn't need lots Of shade but I don't have it sitting right in the window for full sun; I keep it back where it gets, what I call, dappled sunlight. Dodge, I have lots of Willies!! 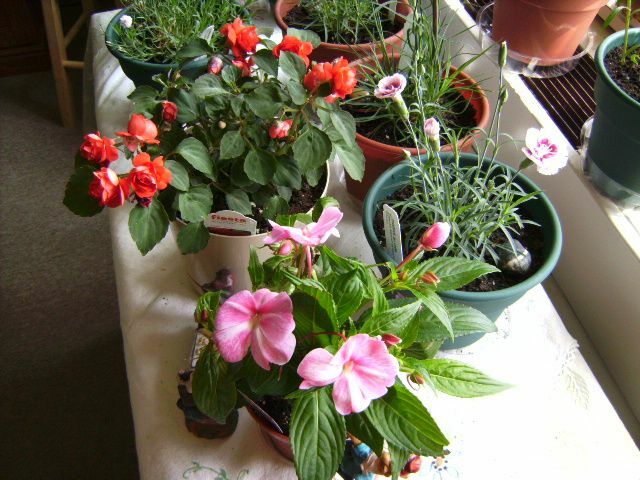 do you have a balcony or patio that you sit your plants on? No Sheri, I don't have a balcony or anything, just a table in front of the big window. WOW Shirley - I am VERY impressed!!! You certainly have a green thumb, to be able to get all those blooms indoors! Everything looks so nice and healthy! Yes, Diane, I do. But first I have to tell a sad, sad story! The very few days I was gone to Texas was very hard on some of my plants!! I lost ALL of those blooms and buds on my Impatiens! And, the Zinnia plants leaves were brown at the bottom and a third of the way up, and the stems, above where they were tied to a stake, were flopped way over, gasping for water!! I have to water them really often. When I got back home there was no help for any but the Zinnias. I put everything in the sink one at a time and drenched them good until the water ran out the bottom of the pot, then put water in their tray, and set them all back in the window. The Dianthus are all green and growing like weeds! But not budding!! Except, for my Jan Louise !! The Impatiens are looking green and healthy, but not budding. 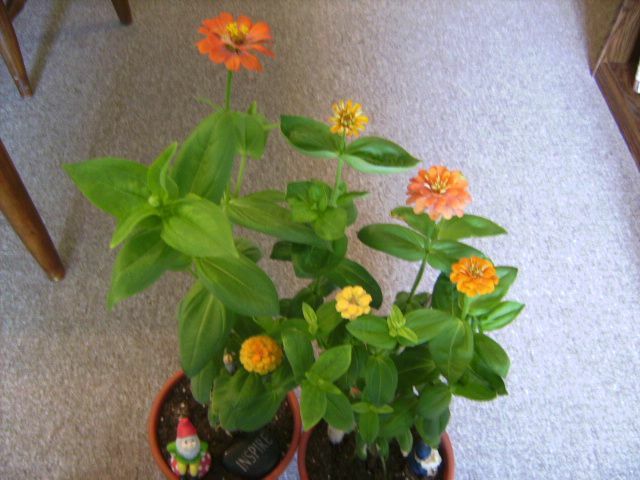 The Zinnias....wow....they lifted themselves back up, and have kept on blooming!! I have two dried blooms which I will harvest seeds from. I will show some pictures in following post. I tried to put images here from photo bucket, like in any other post but it won't show the image!!! I tried to add more with Photo Manager to the top group of photos and it won't add any!! Help!!! What do I do???!!!! Last edited by Shirley4; May 29th, 2009 at 06:34 AM. Well I got some help from Cindy so I will try again. I see elsewhere that a new Dianthus photo went into this gallery topic but I don't see it added up above??! Well I will put some more in here but I don't know where they will go!!! I will add two more Dianthus, and two new Zinnia pictures I took...yesterday? I think. Well cr*p!! Cindy said don't forget to click on Change Post. So I clicked on Image Manager, uploaded some pictures and named them, 'clicked on done adding images'but then there was no 'change post'!!! came back here and clicked on 'change post' and it didn't change anything but this!!! I hate it when things won't work for me!!!!! Last edited by Shirley4; May 29th, 2009 at 09:41 AM. Did you get it figured out yet??? I've had problems posting to this forum before too Shirley. Usually after a while it will work so keep trying. But now I can find anything that says 'add more photos' or anything, so I'm still stumped!! I did this before but it seems to have all gone out of my minded!! Shirley, I don't think you can add to an existing thread. You have to start a new one. So you can have your own gallery here!! I think you should contact Better Homes & Gardens and show them your garden. I'll bet a lot of apartment dwellers or people with tiny yards don't know they can grow inside. Of course, a lot of them can't because they don't have your talent for growing, but maybe a few could.